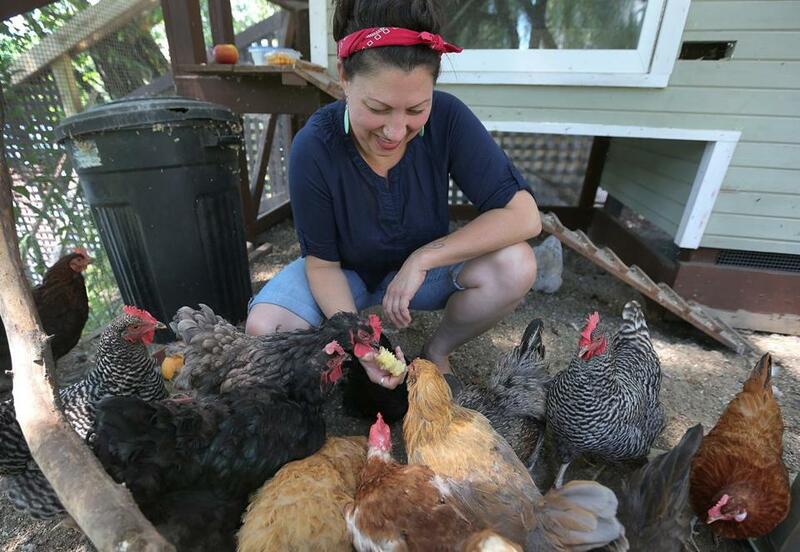 Khrysti Smyth is a backyard chicken farmer who is also the go-to expert on urban agriculture. “I helped pass the first prochicken ordinance in Boston and now offer seminars, classes, chicken consulting, and kids programs,” she said. Everyone tells Khrysti Smyth their chicken jokes, and this is one of her favorites. Smyth is the self-proclaimed Chickeness, a chicken concierge who is a master at all things poultry. A backyard chicken farmer for more than a decade, Smyth is the go-to expert on urban agriculture, whether coop-building, municipal zoning, or egg-laying. Smyth spoke about her company, Yardbirds Backyard Chickens, and why she’s game for fowl play. “Chickens are kind of magical. I have a fascination for these odd, dinosaur-like creatures. Watching them do their chicken-y thing is very therapeutic and calming. They are the iconic emblem of pastoral life, the representation of a broader local farming movement. There’s a saying that chickens are the ‘gateway livestock’ that lead to goats, pigs, or even cows. “What are the benefits of keeping chickens? Most people initially think about the egg production aspect, but that’s by far just part of a long list of enrichments that chickens offer. Chickens add a whole new level to gardening, fertilizing the soil, and clearing the beds of weeds and bugs. They reconnect us with where our food is coming from. “Watching Chicken TV is better than anything you can see on cable; they have their own personality and voices. I grew up in San Francisco and was very aware of the concept of sustainability and this progressed into an interest in food systems. I did a ton of research on chickens, built my own coop, got my own flock, and it took off from there. I helped pass the first prochicken ordinance in Boston and now offer seminars, classes, chicken consulting, and kids programs. “Getting a coop and run designed and installed is by far the biggest monetary investment in the life of a chicken, but once it’s set up, taking care of these birds is exactly the equivalent of having a hamster, except they live outside and provide breakfast. “There’s this thing called ‘chicken math,’ a phenomenon where you think four birds will be fine, then start thinking, ‘Well, I could just get one more, and then I would also like to try this other breed,’ and four turns into 10. So be sure to plan big. Cindy Atoji Keene can be reached at cindy.atoji@gmail.com.